Discussion in 'Modified Explorations!!' started by Super Serg, December 24, 2004. Is it an easy swapping? You'll notice that the Sport's front bumper (the black upper part) and grille in top picture are integrated as one piece - unlike the XLS/XLT (bottom picture). Also, because of this, the curves around the headlights are different. Now you could cut the "nostrils" off of the Sport's bumper and fill the hole left over with some fiberglass - that'd probably work. So as for your question on whether or not its an easy swap - IMHO its not too easy. It would take a little bit of fiberglass work to have the curves of the Sport's bumper line up with that of the XLT/XLS's - like around the headlight area and the flare near the wheel well. The hardware mounting underneath should be very similar though. 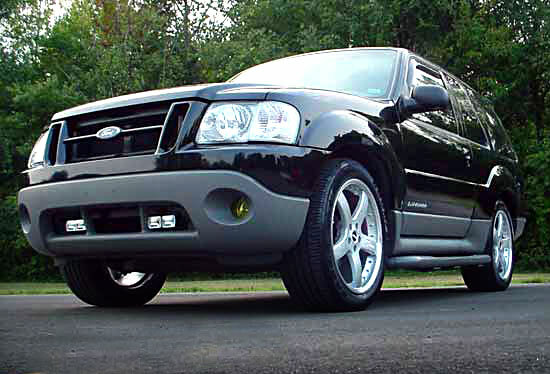 the sport changed in 2001 and the rest of the Explorer line changed in 2002. So the first photo is a 2001 which is a third gen sport. I said all that to say what IZ said. No, it is not as easy swap. Oh and also, do not let me deter u from ur goals! if you have a deep desire to do it, well then whip out that trusty 3/4" socket and lets start turning those bumper nuts!!! !